Enjoy our accommodation while you experience the numerous cycle trails in the Taumarunui Ruapehu Region. Some of these are part of the official network of New Zealand Cycle Trails such as The Timber Trail but there is also a number of other opportunities to cycle in various parks and other locations open to the public. The Timber Trail Cycletrail (From Ongarue, through the Pureora Forest to Pureora) and covers 85 km of cycling pleasure through magnificent native forest, across deep gorges (all bridged), along historic bush tramways and through the Ongarue tunnel and spiral. The majority of the trail is in Pureora Forest Park. There is a halfway point at Piro Piro flats which gives an opportunity for both one-day and two-day cycle rides. To arrange your cycle adventure click on the Epic image below – but we look forward to having you stay with us. Ruapehu to Whanganui (Mountains to Sea) Cycle Trail. From the flanks of Mount Ruapehu to the coastal shores of Whanganui, the Mountains to Sea Cycle Trail is a route encompassing majestic mountains, stunning native forest, and the spiritual, cultural and historical highlights of the Whanganui River. The Ohakune Old Coach Road Cycle Trail takes you though an area of rich pioneering history. Recently restored and now part of the Mountains to Sea Cycle Trail, the route wanders the lower slopes of Mt Ruapehu, passing historical sites including the camps of railway workers, the ruins of the Taonui viaduct and the Hapuawhenua Viaduct. The trail can be completed from either Horopito or Ohakune, a Grade 2 track suitable for most fitness levels. Horopito to Ohakune is a slightly easier route featuring downhill sections. There are plenty of local mountain bike rentals and transport providers available. The 42 Traverse Cycle Trail (Mount Tongariro) Known as being the greatest mountain bike ride on the North Island, the 42 Traverse follows an old logging road and is filled with exhilarating downhills, some challenging uphills, and is known for having many rutted sections along the trail. Wainone Trams Mountain Bike Trail. 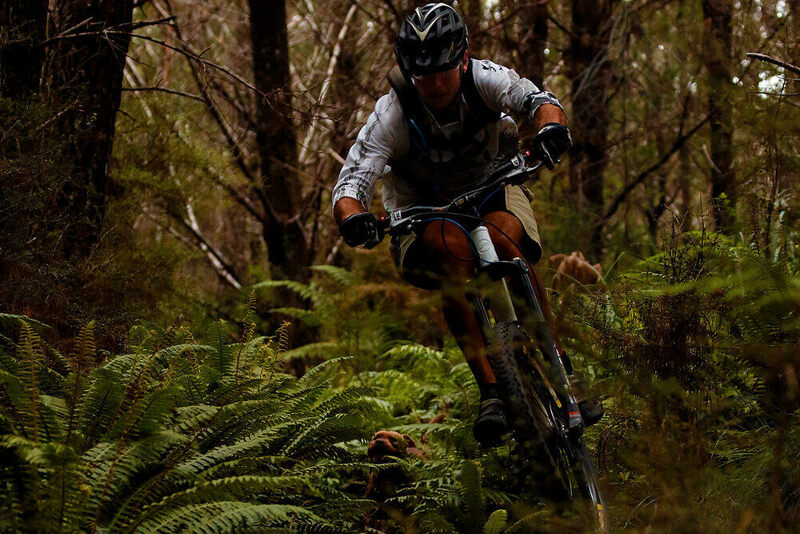 The 25 kilometre Waione Tram Mountain Bike Trail is made up of two distinct sections in the Maramataha Valley at the southern end of Pureora Forest Park. The first is an out and back trail with some steep sections that might have many riders pushing their bikes. The second section is a loop trail that links back to the main access artery. Whangamomona Cycle Trail. The 80 kilometer Whangamomona Cycle Trail route runs from Taumarunui to Whangamomona a historic town that declared itself a republic in 1989 and sells its own passports. You can then cycle on to New Plymouth if you wish or return to Taumarunui. From Taumarunui ride south on SH4 to Piriaka where on the hill to your right is the oldest uppainted house in New Zealand. Continue past the village a short distance uphill until Makomiko Road turns to your right. follow this road back to Taumarunui crossing the Whanganui Rive over Victory Bridge. The ride is rated at beginners level. This short bike ride is all sealed and easy riding. Turn right at McDonald’s corner and follow Golf Road past the golf course and onward until it becomes Ongarue Back Road at the second roundabout. Ride through the rural area to the double road/rail bridge and then return. A pleasant ride for all. The Hikumutu Trail takes cyclists on a tour through amazing countryside with sections of steep and narrow terrain along a gravel road. It is probably better to start in Owhango, cross the railway line then turn right into Hikumutu Road. This continues through to Victory Bridge in Taumarunui. This can be done in reverse but has steep climbs if done this way. The ride is rated at an intermedite level. Start at Owhango and go past the Owhango Hotel and turn right into Kawautahi Road. The seal runs out after 2.2kms and the road becomes winding and steep. The countryside is rugged and scenic with plenty of bird life. Enjoy a stop at the beautiful Kawautahi Falls which is 12kms into the ride. The ride is rated at an intermediate level. A good scenic family ride rated at beginners level. From Taumarunui head south to Mananui via Taupo Road, cross the bridge then turn right onto Racecourse Road. Cycle along this road and back to Taumarunui to Victory Bridge where you turn right to re-enter Taumarunui.